The first step is to properly clean the fish. In our case, we buy already cleaned slices, so we only have to rinse them well before we use them. The next step is to apply the first marinade (of salt, turmeric, and asafoetida) and set it aside for 15 to 20 minutes. Then you can mix together the spices for the second marinade, and start applying it to the fish, till all the pieces are coated evenly and well with the spices. 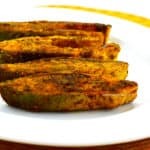 After this, ideally you should let the fish marinate in the spices for an hour, but if you are in a rush, it’s okay to start applying the outer crust coating 15-20 minutes after the second marinade. Speaking of the crust coating, I usually mix equal parts semolina/sada rava and rice flour, with a pinch of salt and then apply that on the fish before frying. But you can always substitute cornflour instead of rice flour, if you feel the necessity of a binding agent. I don’t. I personally like the outer crust really crispy, so I go with semolina and rice flour. Also, like I mentioned in the list of ingredients, adding salt to the outer crust coating is optional, but recommended. Once you have applied the outer crust coating to the fish, it’s time to fry the pieces. I’d recommend pan frying the fish on medium heat (and not overcrowding the pan – just 4-5 slices in one batch, depending on the size of the slices) till all the pieces are well cooked. It should take you 3-4 minutes per side, so 6-8 minutes for both sides. I fry the other 2 sides with the skin too, for a minute each, but this is completely optional. Once the fish changes color and develops a slight crispy char on the surface, it’s done, and ready to serve. If you do not get pomfret (especially in US) you can make this with Pompano fish too. Same awesome taste! I usually marinate fish in two stages, choosing to apply salt and turmeric first, and then the other flavoring spices. Because I personally feel the fish absorbs the salt much better when applied first, and then turmeric has antibacterial properties. But you can mix all the spices and apply it at one go, and that will be fine too. The fish is spiced to suit our taste buds, which can be spicier than average, so always adjust the spices to suit your palate. Or just add a splash of lemon to the marinade to cut the spice level. Always adjust the spices/ masalas based on weight and not the number of fish, because the size of the fish can vary. For instance, here in US, we get larger versions of pomfret than back home in Mumbai. I know I have listed dried coriander flakes as a part of the flavoring spices, but it’s completely optional if you don’t have it on hand. Because it doesn’t really make much (or any) difference when it comes to the taste. It’s really just another quirk of mine, which makes me want to add something green, lol.